In this photo taken on Feb. 5, 2013, a Brown Tree Snake is held by U.S. Department of Agriculture wildlife specialist Tony Salas outside his office on Andersen Air Force Base on the island of Guam. The Hawaii Department of Agriculture is importing four dangerously invasive brown tree snakes in an effort to prevent the species from establishing themselves in the islands. Jonathan Ho, acting manager of the department's Plant Quarantine Branch, says the Hawaii Board of Agriculture approved a request for the sterile, male snakes to be used in a dog detection program. West Hawaii Today reported Monday the snakes will be used to train four dogs to hunt for the snakes that could enter Hawaii by plane, ship or cargo carrier. Ho says brown tree snakes invaded Guam and nearly wiped out the island's bird species. Hawaii has several species of protected and endangered birds. 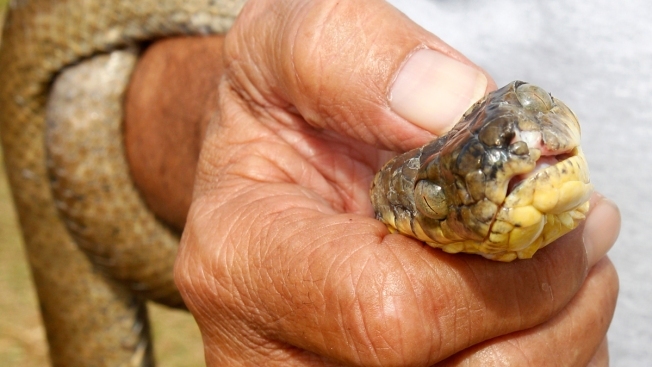 Hawaii has no native snakes and the last time a snake was found in the state was in 1998.